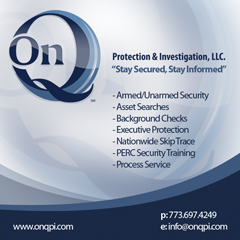 ONQPI - A trusted Security Guard Company providing services in Chicago. Whether you are building from the ground up, or have existing facilities that require effective security solutions, ONQPI security experts provide Site Surveys, Risk Assessments, Physical Security Solutions, CCTV Monitoring, Access Control, Armed & Unarmed Uniformed Security Guards, Private Investigations, Commercial Intelligence Gathering, Business Continuity Planning, and related security services. ONQPI, a trusted Chicago based security guard company, offers you fully trained and certified armed and unarmed security guards to provide a more specialized service designed to meet your highly sensitive security needs. Whatever your situation may be, we will tailor our security guard services to provide you with the necessary protection. ONQPI is a full service security guard company, providing Private Security Guard services to the Greater Chicago Metropolitan Area. We also service surrounding municipalities as well as National and International clientele. Our trained and certified security guards are prepared to handle any incident that may arise and have a wide range of experience handling security matters in a variety of industries, with a specific focus on the retail and large populous venue. Recruiting, Screening & Hiring. There is nothing more important! Creative & Innovative recruiting practices are tempered by stringent screening measures that include a comprehensive employment application, a 2-phase interview process, criminal background and credit history checks, reference checks and motor vehicle checks screening. For those who pass, random drug testing may also be performed depending on state law and Client requirements. Training. ONQPI provides Security Guard’s with a 40+ hour competitive curriculum that exceeds the training requirements for security personnel in any state, and includes group training designed to identify and weed out those who may have passed initial screening but do not meet our performance standards, before they are assigned to a Post. ONQPI Security Guards are also trained in First Aid, CPR and AED. Professional Appearance & Demeanor. Security Officers representing ONQPI will be clean shaven and appear in a clean, pressed uniform on site, and will be on time, remain standing in an Alert-Awake-Ready position, refrain from socializing or talking on a cellular phone while on duty, and otherwise conduct themselves in a professional manner that comports with Client expectations. Effective Communication. Effective verbal and written communication is essential for Security Guards who not only come into contact with our Client’s employees, but in many cases are in contact with our Client’s customers, may need to assist law enforcement in the event of an incident or emergency, or be approached by the news media. ONQPI training includes specific instruction on how to communicate appropriately and professionally, or in some cases politely refrain from communicating with, those they may come into contact with on site. We also train on basic written functions such as writing Daily Activity Reports and Incident Reports.